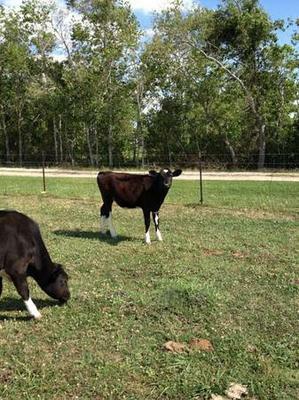 I recently had the opportunity to buy a 5 month-old bull and heifer that originally came from a local dairy. Not culls. They are dexter/holstein crosses. The person I am buying them from had something happen that he could not keep them. I am wondering what to expect with milk production? They both came from a milking herd. The plan is to breed them together, for they are not related and then steer him for beef. Does anyone have experience with this cross and have any idea about end size and milk production? I would be most appreciative for any help. I don't have any personal experience with a Holstein - Dexter cross, hut was wondering if your cross breed is from a full Holstein or a miniature Holstein. Miniature Holsteins will produce 2-3 gallons of milk a day. Full Holsteins are excellent milkers, producing on average, 7 gallons (28 liters) of milk a day. That is a lot of milk, so I hope you are going to make a lot of cheese and ice cream! The Dexter, being a smaller cow, doesn't necessarily mean that they are bad milkers, they aren't. They are not as productive as the full Holstein, but produce the same as the miniature Holsteins, giving you on average, at the height of the milking season, 2-3 gallons a day. So I hope that that will give you some indication as to what you could expect from your Holstein-Dexter cross cows with regards to milk production. I am sure that there are other readers out there who have personal experience with this cattle breed that can give you better advice. I have been breeding this cross for almost 2 years. I did have 2 heifers born this past June that are Dexter/Hol and Dexter/Dutch Belted. They will be bred to my mini Jersey bull next summer. I do expect the heifers to be about 4" shorter than their dams so they won't be too short, about 55 to 59". Milk production wise, I expect about 5 to 6 gallons per day for their first year in milk and then by their 4th year of production to be about 8 gals. There are 28 cows bred to my Dexter bull for calves in 2016 so there will be more heifers added to my breeding program. That is an interesting blend. I can't wait to see the outcome when our girl is in milk. She is only 10 months old now, so she and her mate are still very babyish in behavior. Totally endearing. They stand about 4.6" right now at their shoulders. Then the Dexter is long legged I take it then. It is very interesting to see the crosses. When I picked up my bull from the dairy, the owner showed me a Holstein/Belgian Blue cross. The Belgian Blue is a double muscled breed and it sure shows on the heifer. My Dexter bull will be breeding her when she is old enough. Will be an interesting addition to the mix. Whenever a shorter breed is introduced to the taller, expect the calves to be 4 inches shorter than the dam when they are adults. There are breeders that have Jerseys that use a Mini Jersey bull to bring down the height but it usually takes a few generations to get the calves down to the height of the Mini Jersey. Thanks for your response. I would love you to post your averages, and I will post mine. Love the nature of my crosses. Last month my Dexter bull was with 10 standard-sized Holstein heifers at the dairy down the road from me. We expect them to be 4 inches shorter than their Holstein dams. As for milk supply, I'm guessing they will produce less than a standard Holstein but it all depends on the genetics of both animals. I'd expect 5 to 6 gals. I will be getting 2 heifer calves next June when they calve out so it will be close to 3 years before I know for sure. Thanks for your response. The Holstein is full size and so is the Dexter. I figured I might end up with the size of a mini- Holstein, but I wasn't sure how much a mini Holstein would produce. I would love to have any additional comments about expectations. Thanks again.